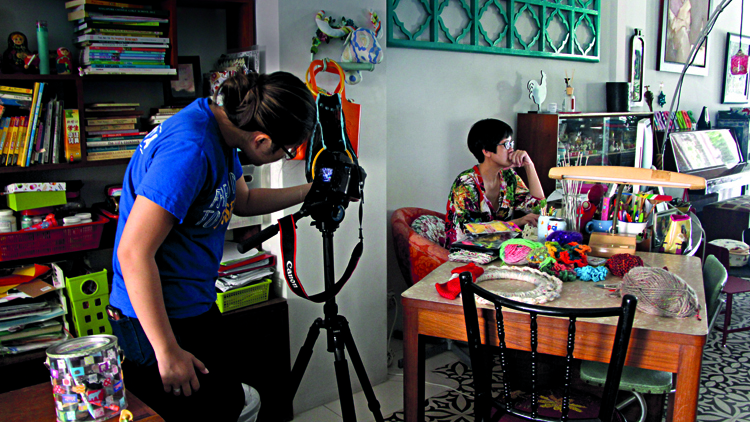 Actress Karen Tan getting her portrait taken. Singapore’s theatre scene is celebrating the nation’s golden jubilee in a big way, and many companies are putting on plays or adopting themes that have a particularly strong local flavour. In April alone, many of our most respected theatre practitioners are celebrated in Esplanade’s The Studios: fifty series. But what about the people who make the magic happen? Well, they’re the reason that two UK-based Singaporeans are putting together a project called Theatre Memories, which applauds the hard work that people in the performing arts community have been putting in to light up our stages month after month. ‘I came up with the idea as I felt a personal urge to pay tribute to the people who have shaped the theatre scene here in such a short period of time,’ says Jennifer Lim, an actress and filmmaker. At the heart of their project is a series of video interviews that the team conducted with 50 key players in the field, from big-name directors and actors to the best hair stylists and costume designers. Fifty, as the pair admits, is an arbitrary number, but it’s as good a start as any when they’re faced with such an enormous task. ‘It’s not an exhaustive list, but a representation of the industry right now,’ Lim is quick to point out. They started the project by coming up with a huge list of names, and then talked to other industry professionals to whittle it down to a more manageable number. ‘The performing arts are so transient and ephemeral, and things get lost so easily, so we’re hoping to keep their legacy alive through the memories of these 50 practitioners,’ explains Annie Jael Kwan, a producer and curator who’s collaborating with Lim on the project. By asking them a set of specific questions like what their first experience of theatre was, how they think the scene has changed since they first started off, and more light-hearted ones like how they would explain the Singapore stage to a Martian, Kwan and Lim ended up with hours of footage that not only present an overview of the theatre landscape, but some very personal stories, too. What struck Lim most about the scene’s evolution is its gradual professionalization and the diversity of the types of local productions. Theatre Memories is presented to the public through two main avenues: the edited footage is stored at the National Archives and accessible to anyone, but if you’re the more hands-on type, then head on over to their eponymous exhibition at The Arts House this month. Visitors will be taken on a journey through five sections of the building, including the box office and the Play Den, and, through props, given a sneak peek of life behind the bright lights of the stage. Acknowledging that it can at times be difficult to pique people’s interest in the performing arts, Lim and Kwan are nonetheless confident that if they make the space intriguing, people will come. They’re convinced that the project is an important homage to where Singapore theatre now stands. ‘I hope that through Theatre Memories, we can throw off the shackles, stop thinking that we need to “catch up” to what the West is doing, and see that our works are just as good,’ adds Lim.